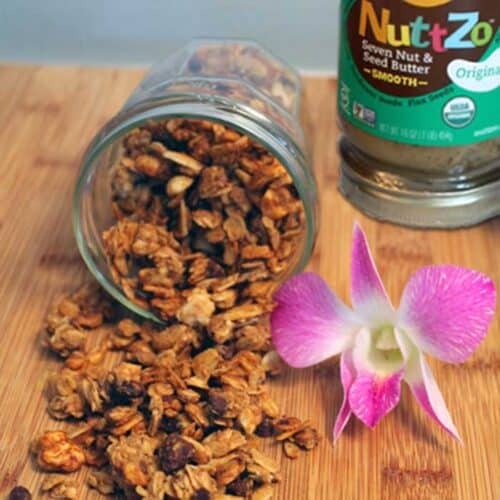 Easy homemade granola that’s super delicious, gluten-free & healthy too! Packed with NuttZo Nut & Seed Butter, chia seeds, flax seed & oats then sweetened with honey. Yum! Preheat oven to 300 degrees. Spray 2 cookie sheets with nonstick spray. In a large bowl, combine oats, nuts, chia seeds, flaxseed and chocolate chips. In a small microwave-safe bowl, melt coconut oil in microwave for about 20-30 seconds. Whisk in NuttZo, honey and vanilla extract. Mix well. Add liquid to dry ingredients and stir until oats and nuts are well coated. Spread evenly onto prepared cookie sheets. Bake 35-45 minutes, stirring halfway through, or until granola is a beautiful golden brown. Keep a close watch as it can burn very quickly. Remove from oven and let cool on cookie sheets. Store in airtight container. This mixture should keep at least 2 weeks.